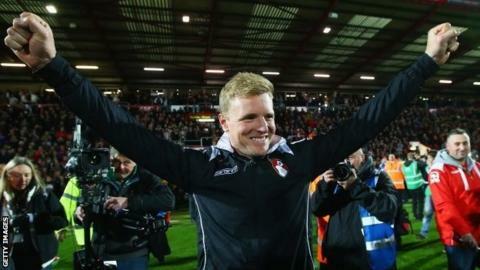 Bournemouth boss Eddie Howe says after effectively sealing a Premier League place the club would now love to finish the job with the Championship title. Watford hold a one-point advantage over Bournemouth, ahead of the Cherries' final game at Charlton on Saturday. But after missing out on the title when earning promotion from Leagues Two and One, Howe now wants some silverware. "Of course you do [want the title]," the 37-year-old told BBC Radio Solent. "That's been a frustration for us." Howe steered Bournemouth to promotion from League Two in the 2009-10 season despite a transfer embargo. In 2012-13 Howe returned to the club and led them from near the foot of League One to promotion into the Championship as runners-up. "The first one in League Two we were embargoed and battling the odds so just to get promotion was a real achievement," Howe said. "The second one we came in a few games into the season so had a lot of work to do to get back up there. This one we are competing in one of the hardest divisions in world football. We would love the title. "It's not in our hands, it's in Watford's and we can just do our bit and that is what we are focused on." He added: "We want to finish the season well, and are focusing very much on Charlton. The main focus is to win the game and do our bit." Promotion was all but sealed after Monday's 3-0 victory over Bolton on a memorable night at Goldsands Stadium. Only defeat, a Middlesbrough win and a 20-goal swing on the final day of the season can deny them promotion. And Howe said he had seen no let up in the attitude of his players despite their achievement earlier in the week. "When I took training and saw the lads perform and saw their mentality I was very impressed," he said. "I've had no problem bringing them down. "They are naturally in good spirits, feeling good about themselves and that can only be expected. Hopefully everything that has happened can make them better and more confident. I've seen a really positive reaction."